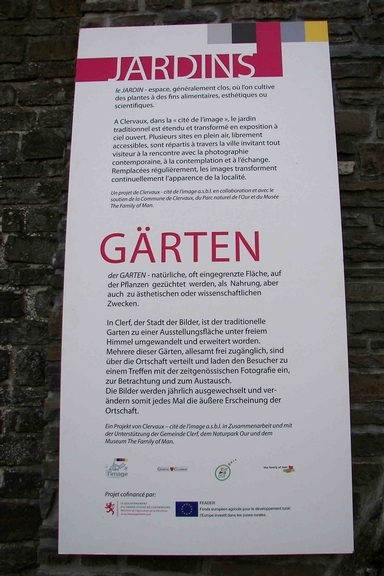 The 'Gardens' project has been promoted by the association 'Clervaux-Cité de l'Image', in cooperation with the Municipality of Clervaux, the Our natural park and the artist Edward Steichen. The first edition of 'Gardens' was launched in 2000, in the framework of the project 'Jardin…à suivre', supported by INTERREG III. In 2004, the cultural initiative 'Cité de l'Image' was then launched in Clervaux. The non-profit association 'Clervaux-Cité de l'Image', created in 2008, has developed a programme for 2008-2013 aiming at the expansion of the 'Gardens' project. The idea, simple yet original, consisted of combining nature and culture. The name 'Gardens' identifies outdoor sites dedicated to the creation and exhibition of visual arts. The main objectives were to develop centres for socio-cultural activities, promote the cultural identity of Clervaux and emphasize its potential as a tourist centre, as well as its peculiarities compared to other destinations in the same region. Four sites have been adapted to host photos exhibitions and equipped with adequate lighting to allow 24h/24h access: 1) 'Champ libre' is a grass surface with 5 steel structures for the installation of art works; 2) 'Echapée belle' consists of steel bars fixed into the stone to showcase photos; 3) 'Carroussel d’images' is a prism-shaped metal structure in the outskirts of the city; 4) 'Arcades' consist of 8 arched niches. The project contributed to the visual attractiveness of the town while promoting the quality of the local environment. Moreover, the rural location of the exhibition sites allowed visitors to get closer to nature. As the exhibition areas have no surveillance operating, the risk of vandalism cannot be excluded. Also, interacting with visitors and informing them about the artworks proved to be more complicated in an open-air site than in a traditional exhibition space. 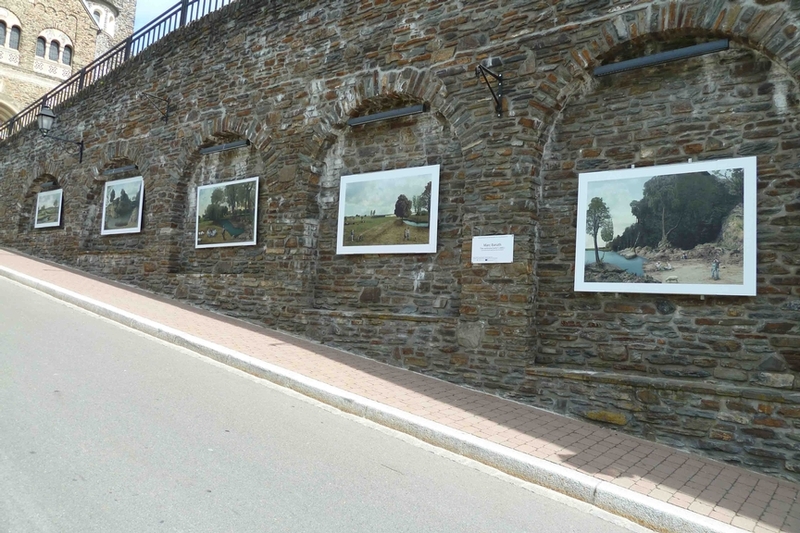 Given the positive impact of this initiative, it is planned to create other open-air exhibition areas and to link each site to the others, in order to create a real ''Road of Images'.